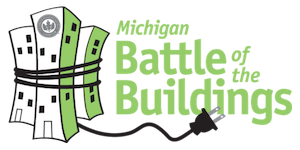 Competitors in the Michigan Battle of the Buildings are categorized by building type and compete against alike buildings. If 50% or more of your building fits one of the below categories then that is your building type. If the building is mixed (ie: 30% education, 35% entertainment, 35% health) then it should be categorized as "Other"
An institution established for educating the public. A place that provides amusement or enjoyment, an establishment providing accommodations, meals, and other services for travelers and tourists, or a place where people pay to sit and eat meals that are cooked and served on the premises. An establishment that conducts financial transactions such as investments, loans and deposits. An establishment that makes products on a large scale using machinery or processes raw materials. Building designed as a residence for more than one family. Building used as a place for commercial, professional, or bureaucratic work. Any establishment distinct from any of the other categories. A specially designed structure or consecrated space where individuals or a group of people such as a congregation come to perform acts of devotion, veneration, or religious study. An establishment that sells of goods to the public in relatively small quantities for use or consumption rather than for resale. A commercial building for storage of goods or materials that may be stored before their export, a distribution for sale or a service, or a building used for maintenance, service, & storage.